Well, it had been a while since I had caught a musky in my Prowler and it was time. Early June means one thing- A time to try out all the new baits I have bought over the winter ( and sharpened several times). It was a calm morning and I had the river all to myself. Alot less pressure then filming GAME ON 1… this was training for the second DVD shoot we are doing in September. I had 2 sets up hook cutters with me and a new set of pliers ( just in case). I brought a small mix of baits with me – jerkbaits, topwaters and some spinnerbaits. Did not take long for a small musky to find my offering . I saw a gold flash beside my kayak and started my figure 8. BAM! she is hooked and quickly is landed. A quick solo photo and back in she goes . Nothing better that a musky landed by 515 AM- the pressure was off. I paddled up river and tried to located some green weeds. The spring was a cold and wet one and weed growth in the river is a few weeks behind. Getting ready to go, I finally gave in and said last cast…as soon as my spinnerbait hit the water it was Game On… a great fight, 2 jumps and in she comes. 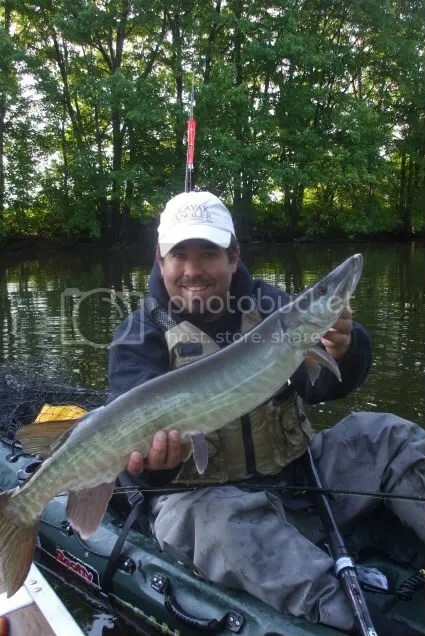 A nice 38″ musky. Thank you to the kind gentleman paddling by for taking a quick photo.